The papaya, with its deep and rich colour, holds many benefits. Easy enjoyment of its smooth and butter-like interior just requires a smooth slice. With its vivid orangeness, a ripe papaya fruit is a real gem of the tropics. Even Christopher Columbus called it the “fruit of the angels”. Served chilled with yoghurt, or a simple slice and just a squeeze of lime are some of the best ways to enjoy its refreshing perks. Papaya, known as Pawpaw in Australia and New Zealand, is ubiquitous in Thailand. Also native to southern Mexico and Central America, the Spaniards centuries ago took the papaya seeds from the coasts beyond Panama to Manila and then Malacca. Today it is cultivated throughout the tropics. Papaya is an excellent source of vitamin C, folate, potassium, dietary fibre, vitamins A, E and K and papain, an enzyme which helps digest proteins. In the ancient Mayan civilisation, the people honored the papaya tree and called it the “Tree of Life”. The Mayans eat papaya to help with digestion and use it as a paste to heal a skin rash or other skin problems. Hawaiian and Mexican are two popular varieties of the papaya fruit. Both are pear-shaped, but the Hawaiian papaya tends to be smaller, sweeter and easier to harvest. Traditionally, papayas are grown from seeds, so the plants are not always true to their parents. In Thailand, the fruits have been evolving, and the four most popular varieties are Khaek Dum (green and crisp when unripe, yet red when ripe), Khaek Nuan (a hybrid from Khaek Dum, crunchy when green and sweet when ripe with an orange-red flesh), Holland (also known as Red Maladol from the Mexican variety, crisp and sweet when ripe) and Rai Nam Phueng (extremely sweet when ripe but tends to be mushy). While many parts of the world don’t consume raw green papaya, Thais enjoy it as much as when it’s ripe. The famed Som Tam, a salad made from unripe papaya combines the primary tastes of the local cuisine: sour, spicy hot, savoury salty and subtle sweetness. Papaya seeds are also edible: the taste is a cross between mustard and black peppercorns and can be grounded like black pepper. In India, the leaves of the papaya are often prepared like spinach recipes, and the papaya leaf extract is used to fight dengue and malaria. 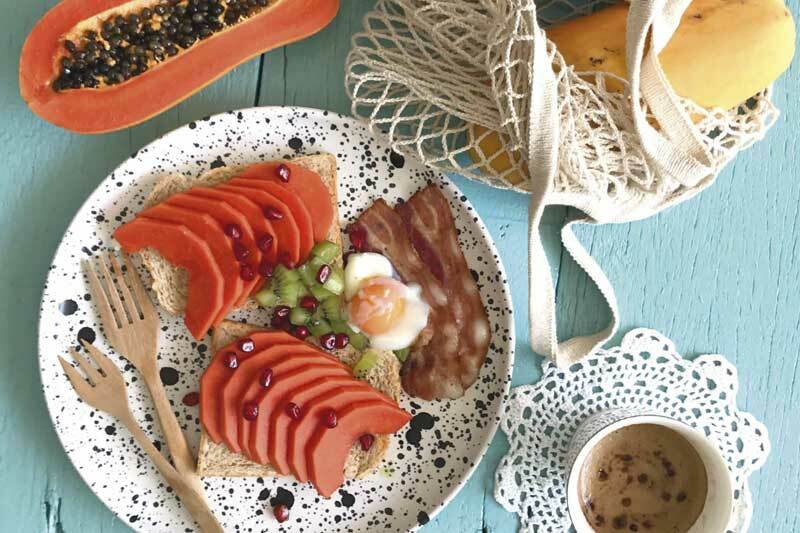 it’s not just the apple a day that keeps the doctor away – so does a papaya.